We can print your high-resolution digital images on 10-mil gloss photo paper in custom sizes not found in your typical print shops. We can do panoramic images, 16" x 16", and large prints such as 30" x 40"! To really make your high-resolution images stand out, consider printing them on canvas! 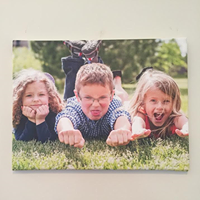 Our acid-free canvas material is wrapped on an interior wood frame to make your full color images pop! Sizes range from 8" x 8" all the way up to 40" x 50" to create the perfect look for your space. How do I print my digital image? Contact us today to speak to one of our experts! We will guide you through the process to creating your custom photo or canvas print.